Kelly allowed three runs (two earned) on two hits and three walks while striking out one over 1.2 innings Tuesday against the Royals. Kelly, in the mix for a spot in the rotation, has been hit hard. In two outings, he's allowed six runs (five earned) on five hits and four walks. 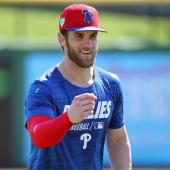 After spending the last three years in Korea, the 29-year-old Kelly is an unknown, which can be an asset for pitchers, but MLB hitters are having no problem against him this spring.